You can have several templates. Each template has own logic and source of feed files. You see the last result of importing feed files for each teamplate. Format - select the type of format external feed file, ex, CSV, XML, XLSX, TXT. You can ZIP this feed file before importing in nop store. Plugin unzip it and import it. 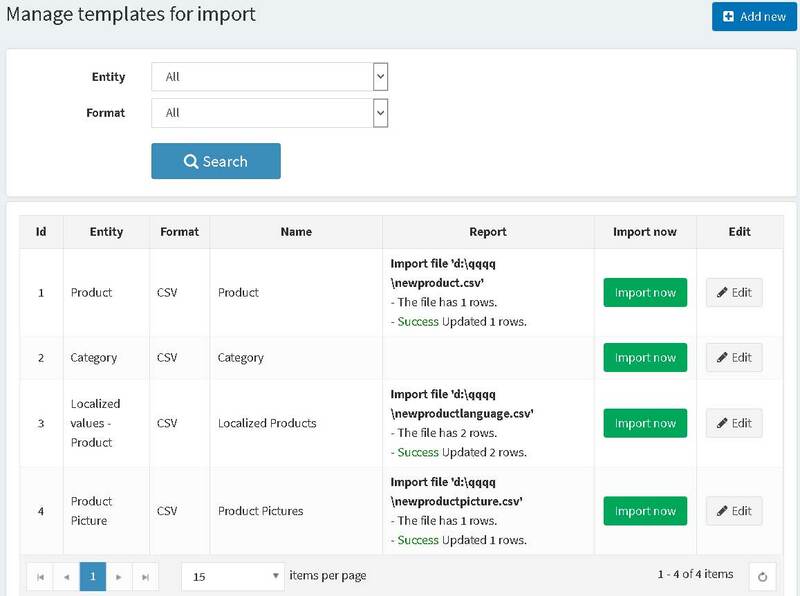 Entity - select what you whant to update - Product, Category, Manufacturer. If you can to update price or stock qantities you should select Product. If you want to update category name with new values, you should select Category. 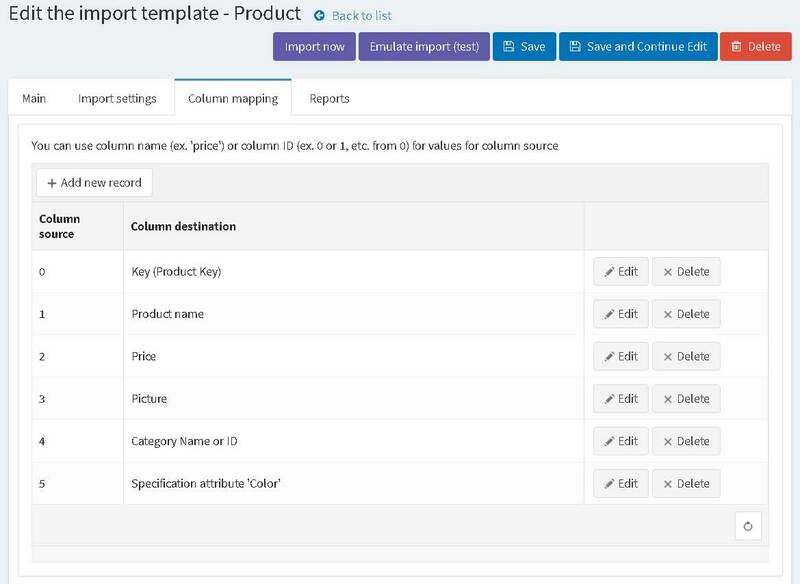 Product Key - If you want to update product values you can provide the ID for mapping values from external feed file and nopcommerce product value. Example. nop product Id, Sku, Gtin, Manufacturer part number. If you want to update Category or Manufacturer you should use nop Id value for these entity values. You want to update price using externak manufacturer feed file. Is Active - plugin can import feed file in automatic mode using shcedule time. Enable it if you want to use this feature. Your manufacturer gives you URL with new price values. You can load new prices automatically. File folder (path) - If you select Folder you can set the folder for external feed files. You can use mask. You can use mask for getting feed files from FTP too. Warehouse - If you want to update stock in only one warehouse you can select it from the list. You have several different warehouses and each warehouse has own feed file. Manufacturer - if you want to update prices or stock quantities from one manufacturer you can use this parameter. You have the feed file from manufacturer and want to update prices using manufacturer part number. 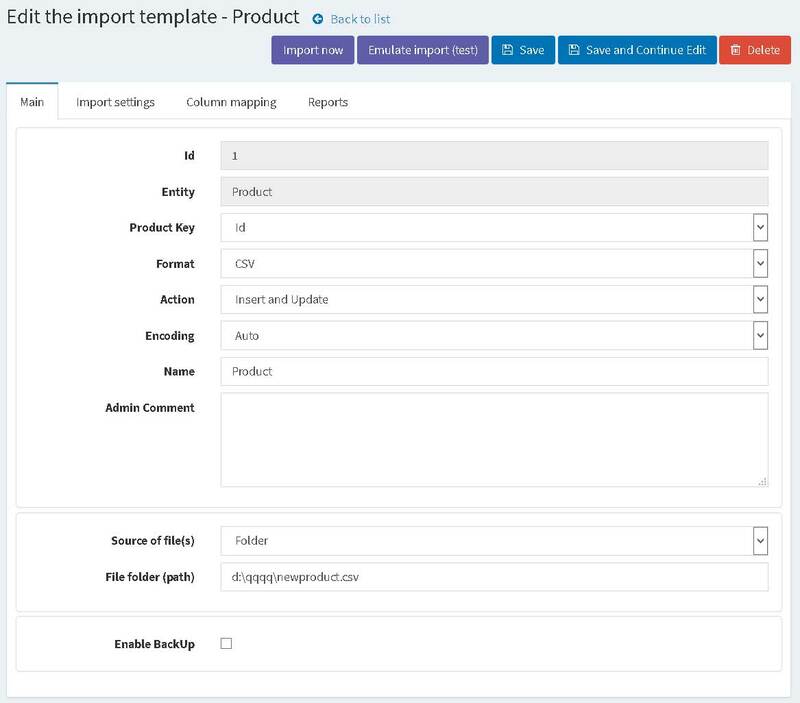 Several products in your nop store can have the same manufacturer part number but you can filter products using this parameter. Vendor - if you want to update prices or stock quantities from one vendor you can use this parameter. You have the feed file from the vendor and want to update prices using SKU. Remove tier prices - if you want to import tier prices you can remove old tier prices before for the same product. Remove old pictures - if yuo want to import pictures you can remove old pictures for the same product before. 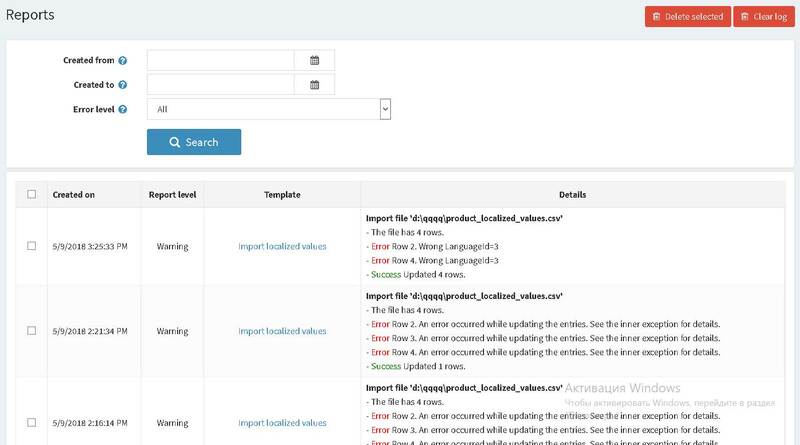 You can configure mapping beatween feed file columns and nop entity parameters. Each entity (Product, Category, Manufacturer) has own entity parameters. You can use the column name or column numner (from 0) for setting the source of values. You can import feed file by schedule. Don't forget to set 'Is Active' parameter. You can see the result of importing feed file. If you need to can send the report to e-mail too. You can use column Id number or column name for mapping. 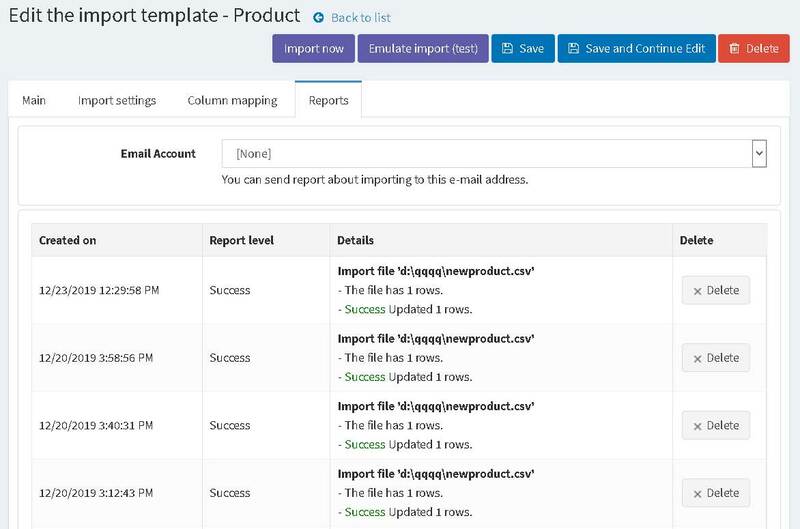 We use 0 for mapping for Key (this template if for Product and you can set what product ID you want to use for mapping (Id, Sku, GTIN, etc.) ). And we column name LanguageId for mapping for Language value. See example. You can use column Id number or column name for mapping. 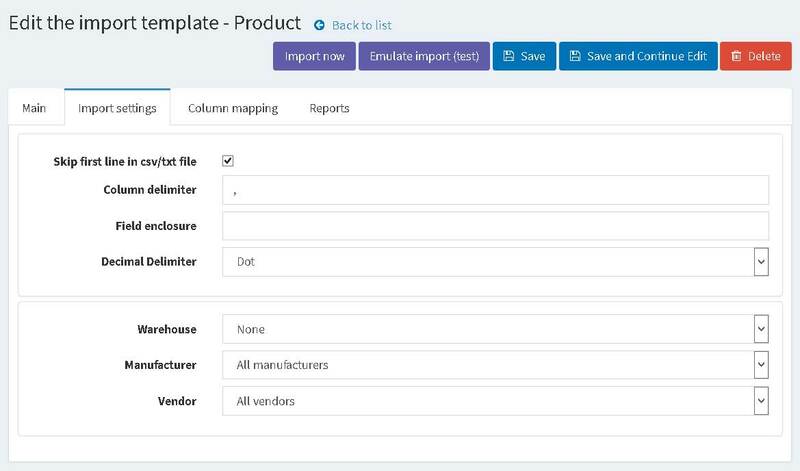 We use 0 for mapping for Key (this template if for Product and you can set what product ID you want to use for mapping (Id, Sku, GTIN, etc.) ). And we column name StockQuantity for mapping for Quantity value. See example. You can use file path or file Url for Picture value.